Living here in Hawaii, an important collection area for a number of popular aquarium species, has sensitized me to a major downside of our desire to maintain and observe the beautiful and fascinating creatures of the tropical reefs in glass boxes in our homes. While none of the fishes collected for the international trade in ornamental species are endangered, it is clear that there have been important reductions in population of targeted aquarium fishes here, especially the Yellow tang, Zebrasoma flavescens, with all parties in agreement about these reductions. This has led, as I’ve reported before, to active hostility in Hawaii to aquarists in general and aquarium fish collectors in specific and to the establishment of “no-take” zones for aquarium collectors. Approximately one third of the western, or Kona, coast of the Big Island of Hawaii has been set aside as “Fish Replenishment Areas” (FRA’s) closed to aquarium collection, with the expectation that recruitment and migration will infuse the “open” areas with more stock, an intervention that has proved successful in food fish management. I have also reported that, after two anxious years of no change, this year’s transect studies indicate that there has been a significant increase in population for the collected species within the protected areas, justifying the FRA strategy and hopefully pointing to a sustainable aquarium fishery. The absolute population numbers for aquarium species, however, still remain well below pre-collection figures. The likelihood of full population recovery seems low, certainly in the short term. 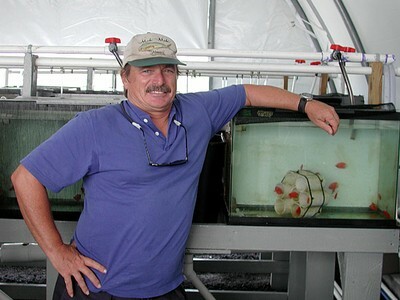 It seems clear that one of the potential mitigators of the unfortunate negative impact that our activities as aquarists has on the population of “targeted” species – paradoxically those we most appreciate and value – is the development of aquacultural techniques for the breeding of important ornamentals, and researchers in Hawaii have made important contributions to this effort. I have reported before on the Waikiki Aquarium’s announcement of its success in breeding and rearing the endemic Hawaiian Masked Angelfish, Genicanthus personatus, on Oceanic Institute’s success in spawning the Flame Angelfish, Centropyge loriculus as well as Dr. Malia Chow’s rearing of Fisher’s Angelfish, Centropyge fisheri at the Hawai’i Institute of Marine Biology. None of these efforts, however, are currently ongoing nor have they led to the successful rearing of commercial numbers of these fishes or to their availability to aquarists. This situation for at least one important species is in the process of being changed. Dale Sarver, Ph.D. and Neil of Black Pearls, Inc., a division of Kona Blue Water Farms, have not only successfully bred and raised the highly popular Flame Angelfish, they are capable of producing them in commercial quantities for the aquarium trade. Both Dale and Neil are highly trained and experienced marine science researchers and commercial aquaculturists, with an excellent staff. Their primary interests are in cultivating pearl oysters and food fish. They are located in the Hawaiian Ocean Science and Technology (HOST) area of the Natural Energy Laboratories of Hawaii Authority (NELHA), the only facility in the world that supplies pristine ocean water, both warm surface water and cold deep water, to land-based aquaculture projects. The Authority provides not only the water for open-system aquaculture but also the necessary state and federal permitting and monitoring of environmental impacts. So how do the Flames fit into the picture? They are the equivalent of laboratory mice in this project! The first criterion for a research subject was to pick an experimental species that that would provide sufficient larvae for research purposes, and the second was to select one that was relatively difficult to rear in order to raise problems that challenge commercial projects. In addition, the experimental species had to have an egg size close to those of desirable food fish species and a similarly small larval mouth. Of great importance as well is a larval form with an inborn, fixed action pattern, food-striking repertoire triggered by the movements of small targets, similar to the patterns of difficult to rear commercial species. The Flames fill all these criteria. They are a relatively difficult group to rear and, under the care of these researchers the brood stock spawn readily and frequently year-round, providing a constant source of larvae for experimental purposes. Their larval mouth size and feeding triggers are within the appropriate experimental range as well. Currently available commercial foods will not maintain the larvae and the research is designed to explore new food items and sources. The Black Pearls project is funded through a three year grant from The Advanced Technology Program, under the National Institute of Standards in Technology, a federal program supporting basic research in important technology. The first step for the researchers is the collection of a variety of potential food organisms from the plankton-rich first two meters of surface water. The research vessel used is outfitted with a collection drum that accepts variable screen sizes so that potential food items including ciliates, crustaceans and the larval stages of another organisms, can be selected by size and then presented to the larvae. The accepted food organisms must then be identified. The final step is the cultivation and enhancement of the accepted food organisms so that their supply is reliable and their nutritional quality can be maximized. 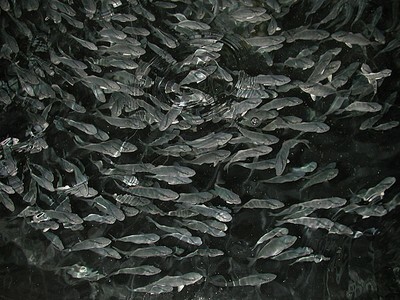 There are a number of critical stages for most fish larvae during the first two weeks. The most critical stage for the larvae is the first feeding, which takes place about three days after hatching. The research program is primarily directed at finding food items for this stage. There is another critical stage at about a week to a week and a half for reasons that are not well understood, probably due to maturational changes in the structure of the larval gut. There is an additional early critical period during the development of the swim bladder when the larvae have to take in a gulp of air. Commercial aquaculture projects often consider three to five percent larval survival rates successful, although much higher success rates are possible in some species. Success rates with Flames depend upon the experimental variables employed. The Flame angel breeders are kept in harems, with one to four females per male. Currently about five harems are being maintained. They spawn almost daily in the late afternoon or early evening, laying hundreds of eggs. The eggs float to the surface where they are collected by surface skimming. The eggs are inspected to verify fertilization, which can range from 100 percent to poor for unknown reasons. Hatch rates also vary, primarily due to experimental variations in hatching conditions such as concentration of eggs and whether or not they are moved. The experimental protocols are always subject to “real-world” constraints of egg numbers and tank space. The Flame Angel larvae are slow in developing compared with those of most food fish, requiring about two months to reach the juvenile stage. At first the larvae are transparent but after feeding for about a week they develop chromataphores and start to look pink. At about two weeks they turn red but retain the larval rather than the juvenile shape. There is no hard and fast boundary between the stages but a gradual change to the form of a miniature adult fish. At this stage the juveniles are “weaned,” and gradually shifted over to small commercial weaning pellets. This period is somewhat protracted for the Flames and they require a relatively long period of simultaneous feeding with live foods and pellets to keep mortality down, compared with the weaning period for most food fish. At about eight months they start to show sexual dimorphism and even start harem formation. It is at about then that they are of marketable size. 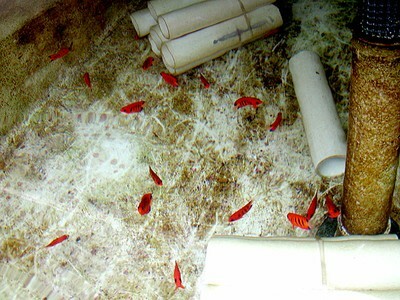 At this point the researchers are not clear about actively moving to exploit the commercial possibilities of breeding and marketing the young Angels for the trade in ornamental species, although they did intentionally select them as a potentially saleable subject for their experimental organism and they have sold a number of them through local retailers here in Hawaii. They also plan to try to breed another dwarf angel, Potter’s Angelfish, Centropyge potteri, with an eye toward a possible commercial venture in the future. The long developmental period of the fish and the associated expenses of rearing and then shipping them make it uncertain that they can compete with retail prices for wild caught fish. This is not an issue for this species alone. Aquarists should demand aquacultured fish when possible, and be willing to pay reasonable premiums for them. Tank reared fish offer a number of advantages to aquarists over their wild caught cousins. First and most important, there is the ethical concern over the unintended but real negative consequences that collection of our specimens entails, as I discussed at the beginning of this piece. You can have aquacultured fish and a clear conscience. 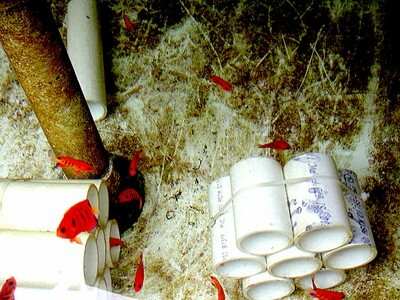 Maintaining tank-reared specimens has other, practical, advantages in addition to a having a clear aquarist conscience. These fish are already acclimated to aquarium life, foods and feeding regimes. Perhaps more important, at least for these Flame Angels, they have been conditioned to living together, rather than aggressively maintaining territories as wild fish do. This may allow aquarists to keep more than one per tank, and even keep them in groups in larger tanks. I have been maintaining two of them in a 36 inch, 44 gallon tank with no signs of aggressivity – on the contrary, they usually remain close together. Unfortunately, these researchers have no experience with marketing and shipping for the ornamental trade. Their primary interest remains in research to discover and develop aquaculture supplies for larval stages of food fish, for which they have received substantial grants. Should they be successful, as their rearing experiments with the Flames indicate, the early larval food is a product with economic potentials far above that for sales in the aquarium trade. In addition, their plans for commercial ventures are focused on food fishes, especially Amberjack, Seriola dumerili (for the lucrative sushi trade), and Mahi mahi, Coryphaena hippurus. For the time being, the Flame Angels remain a marine “laboratory mouse” with an aquarium future. The researchers are currently keeping their findings about food sources for early larval stages secret. This is not unusual among aquaculturists who have made breakthroughs in rearing regimens. When the Hawaiian masked angelfish, Genicanthus personatus, was bred in captivity and the larval masked angels were successfully brought through the 75 or more days to develop from hatching to metamorphosis at the Waikiki Aquarium, the announcement only stated, “A breakthrough came when aquarium biologist Karen Brittain discovered a new, living food source to sustain the small larval angelfish” without specifying the organism. Similarly, when the Oceanic Institute of Oahu announced that they had succeeded in nurturing Flame and Fisher’s Angelfish larvae through metamorphosis at the hatchery they stated, “The key to this recent success was in culturing suitable microscopic zooplankton organism as prey for the angelfish larvae. Conventional diets are too large for such tiny larvae, therefore our researchers isolated plankton directly from the local reef environment” without specifying the prey organism.